An invasive plant is emerging as a major problem in a Nepalese national park renowned for protecting endangered wildlife species, say scientists. The Chitwan National Park is listed as a Unesco world heritage site and is a major tourist attraction. It has been a huge conservation success story, with nearly 100 breeding adult tigers and more than 400 rhinos roaming within its territory. But a quiet intruder has emerged as a possible threat to the park's ecosystem. A native plant of Brazil, the weed Mikania micrantha, has already covered 20% of the national park in southern Nepal. Most of the affected areas are important to the tigers, rhinos and some endangered bird species - moist places and riversides that are conducive to the growth of the invasive creeper. "Already 50% of the rhino's habitat is covered by this alien plant," says Naresh Subedi of Nepal's National Trust for Nature Conservation, which has carried out research in the Chitwan national park. "If uncontrolled, it will spread over half of the park's entire area." Also known as "mile by a minute" because of its fast spreading rate, the weed can smother anything that gets in its way - from grasses to even large trees. "As a result, we have seen some trees grow old quickly and die. And grasses [that many animals eat] have simply disappeared," says Narendra Man Babu Pradhan, chief warden of the park. "We call this vegetation imposition." Conservationists say that the impacts upon the park's animals. "For example, there is this tree that bears fruits called 'rhino's apple' that is killed once it is covered by the [weed]. This means a food source for the rhinos becomes scarce," explains Mr Subedi. Mr Pradhan says that different types of grasses, which form an essential part of the diets of small animals such as deer, are also disappearing from areas of the park invaded by the weed. "Small animals need good quality food and these grasses are very important for them." And if the deer are affected, this is likely to have a knock-on effect on the tigers' diet. "There is a possibility that the food chain in the park is adversely affected," Mr Pradhan says. Dr Richard Kock, a scientist with the Zoological Society of London (ZSL) says that the weed reduces "suitable cover" for the tiger. He is trying to help park officials to tackle the problem. "It forces animals to forage more widely and outside of the park in farmland. This increases conflict and the risk of death from poaching or revenge attacks [by farmers whose crops are eaten up by park animals]," he says. Park officials say they have seen some rhinos that have begun to eat Mikania micrantha because they have "no choice". "As megaherbivores, they need plenty of food, so we can imagine why some of them have begun to eat this plant," says Mr Pradhan. And the droppings of these rhinos, and other herbivores that eat the plant, will spread the invasive weed. The park officials have started to look into how Mikania micrantha is affecting the rhinos. They have attached radio collars to two rhinos and they will track six more in the same way in order to monitor their foraging behaviour. They hope to have the results from this study within two years, but the invasive plant is likely to have spread far more by then. It has already crept out of the park and is advancing towards the west. Latest findings show it has reached the Dang area in western Nepal. Conservationists fear that, at this rate, it will soon reach the nearby Bardiya National Park - another protected area that has successfully conserved several endangered species, including tigers. Scientists say that the plant was first seen in the eastern part of Nepal, where it did some ecological damage to the Koshi Tappu wildlife reserve - a bird watcher's paradise. "The weed covered areas near wetlands, grassland and open places in the forest. [It has caused a reduction in] the number of endangered swamp francolin birds in Koshi Tappu," says Hem Sagar Baral, a noted ornithologist in Nepal. "The creeper alters the vegetation to such an extent that birds do not get the right natural setting for nesting and laying eggs. "Species like the reed warbler and some thrushes are also declining there." Although there is no clear record, conservationists say the plant probably came from India, where it was said to have been imported during World War II. "It is believed that it was brought into India to camouflage army camps during the war," says Mr Subedi. Conservationists say that some national parks in the north-eastern part of India have also seen the spread of this invasive creeper. 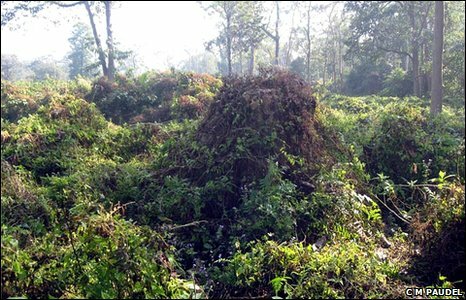 Authorities have tried uprooting the plant from some sections of the Chitwan national park. 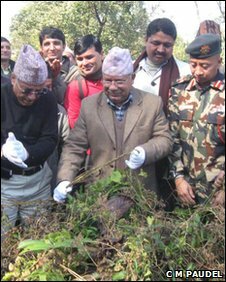 Even Prime Minister Madhab Kumar Nepal rolled up his sleeves when he recently joined a "weeding" effort. But this measure has so far proved unsuccessful because the plant has already covered wide areas. It continues to regrow, stimulated to spread by the movement of people and animals within the park. Authorities do not want to use chemical or biological measures, which they fear could harm the park's ecosystem. So officials are left somewhat helpless. Mikania micrantha continues to grip this valuable natural site, stifling its vegetation and threatening its wildlife.